Cambridge Audio Minx Air 200 review | What Hi-Fi? 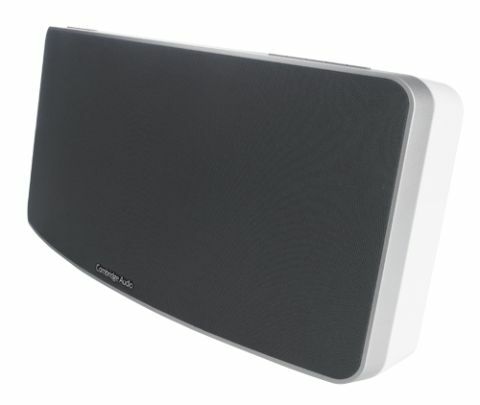 The Cambridge Audio Minx Air 200 wireless speaker system already has the weight of expectation behind it. Cambridge Audio’s first venture into the popular wireless speaker market got off to a dream start: the recently tested Minx Air 100 impressed us with its powerful sound and breadth of wireless features, including both AirPlay and Bluetooth. Not pausing for breath, Cambridge Audio turns up the heat with the next step in the range – the Cambridge Audio Minx Air 200. This £430 wireless speaker system is near identical to the £330 Minx Air 100 in terms of features, but is bigger and bolder in both size and performance (see picture below). The ‘200’ in the name indicates the increased power output: 200W of amplification drives two 6cm balanced mode radiator (BMR) drivers and a 16.5cm subwoofer hidden inside that white-and-grey casing. The build quality is solid, the finish is smooth, and the weight is reassuringly substantial – it feels like a quality product. Its bigger dimensions (45 x 22 x 17.4cm) mean it’s not quite as portable or flexible with positioning as its more compact sibling, but the Minx Air 200 is still compact enough to take pride of place in your living room, bedroom or even kitchen. The triple whammy of AirPlay, Bluetooth and internet radio is the big pulling-point of the Minx Air 200 speaker. It’s rare to find both AirPlay and Bluetooth in the same unit – manufacturers tend to favour one or the other. Cambridge Audio, then, has pretty much hit the proverbial jackpot by offering such versatile wireless music streaming to its customers. It doesn’t matter if your smartphone or tablet is Android, Apple iOS or Windows; they’re all compatible with the Minx Air 200 – which is fantastic news for households with numerous smart devices across all operating systems. The same goes for laptops or desktop computers: all you need is a home network connection and you’ll be streaming in no time. The connectivity doesn’t end there. Cambridge Audio hasn’t shaken off its analogue roots: the 200 offers RCA analogue inputs and a 3.5mm input, so you can hard-wire a TV or any MP3 player. There’s also an ethernet port for wired network connection. As far as specifications go, Minx Air 200 is one of the most comprehensively specified and featured systems in its class. With all these wireless features on offer, setting up the Minx Air 200 with all your devices could well be a time-consuming and frustrating experience – but it’s a straightforward process as long as you have a laptop, a stable home wi-fi network connection and Cambridge Audio’s instructions at hand. Setting up AirPlay (and internet radio) requires you to connect to the Minx Air 200’s own wireless network; type the IP address supplied into your web browser to open up to the set up page; select your own home network, enter the password, and there you go: you can now stream music from any Apple device to the 200. Bluetooth pairing is the same as ever: press the pairing button on the unit and wait a few painless seconds for it to connect with your device. Once that’s all done, you’re now fully connected to the Minx Air 200 – it couldn’t be easier. We were impressed by the sound coming from the compact Minx Air 100, but the 200 shows us how it’s really done. What immediately strikes is the sheer sense of scale coming out of this speaker system. The sound is big and expansive – much larger and more dramatic than we found with the Minx Air 100. It fills our fairly large listening room easily and confidently with an authoritative performance. There’s no struggle or loss of control when things get loud, either. We found the 100 a touch strained at the top end when really pushed, but there’s no such issue with the Minx Air 200. The 200 urges you to crank up the volume and enjoy the music. No matter what source you’re using, it sounds wonderfully dynamic and open, thriving on operating at high volumes. There’s no excess brightness either, and when the music builds up, there’s plenty of space for the top end to breathe and soar without hardening. Play Biffy Clyro’s cover of Buddy Holly, and not once does the Minx Air 200 run out of energy or lose its upbeat rhythm. The 200’s dedicated bass driver (absent from the Minx Air 100) gives the sound a satisfyingly solid weight – more muscular and powerful. A bit of care is needed with positioning, though: we’d avoid placing the unit too close to a wall or in corners, as the bass starts to lose definition. The scale of sound is also compromised, losing the openness and dynamism that we like so much. There is a bass level control at the back of the unit. We left it at its half-way point as it sounded taut and in control – much more so than the smaller 100. Switch tempo to Adele’s Someone Like You, and her voice is layered, solid and personal. We’re impressed by the Minx Air 200’s ability to dig out subtleties and nuances of detail. There’s an enthusiasm to the Minx Air 200 that’s hard to ignore. It steers clear of over-exuberance, but it’s an enjoyable and upbeat sound that’s just fun to listen to. It may not be the last word in refinement – rivals such as the B&W A5 offer just a tad more precision and elegance – but it’s engaging and eager to please. We switched between AirPlay and Bluetooth when streaming music, and found that sound quality is largely the same across either wireless option. Saying that, some might find Bluetooth a tiny bit clearer and more definite with the start and finish of notes. When it comes down to it, we prefer the sound of the Minx Air 200 over the smaller 100. There’s just so much detail, dynamism and engagement on offer that we’d happily cough up the extra £100 – the Minx Air 200 is worth every penny. There are a couple of other points we need to mention. Remote control handsets are getting smaller and dinkier with wireless systems; that’s logical, as you’re more likely to be using your smartphone or tablet as the main control. We found that the Minx Air 200’s supplied remote was awkward to use: it’s too small, with flat buttons that need to be pressed quite hard to work; there’s also a delay between button-press and action, especially when changing volume. It’s all a bit fiddly and frustrating: it’s much easier to use the intuitive controls on your smart device. You will have to use the remote’s volume controls if you’re streaming from a laptop, though. There’s a free Minx Air app that’s useful with the internet radio feature on the 200. There are five buttons on the unit itself with preset stations, but you can select and programme up to 10 of your favourite stations using the app, which show up as little icons with station artwork. From BBC Radio 6 to French station FIP, streaming was quick and uninterrupted. The app also shows which source you’re currently using, allows you to pause playback, change volume, and also play around with bass levels and equalizer settings. The app looks good and it’s most relevant for internet radio, but when it comes playing music via AirPlay or Bluetooth, we found that our smartphone’s own music controls are much more responsive and intuitive, and you have greater control over what music you want to play. There’s no denying it: we’re hugely impressed with what this Minx Air 200 can do. It may be unfamiliar ground for Cambridge Audio, but it’s come into this fast-growing market with all guns blazing. The Minx Air 100 was very good; the 200 is even better. Its offer of both Bluetooth and AirPlay will no doubt attract many a customer, but it’s the powerful, dynamic and open sound of the Minx Air 200 that makes this wireless speaker a formidable option in this competitive market.